She also said that young professionals graduating from MCON have shouldered new responsibilities and newer healthcare needs of patients. Srikanth Phulari, registrar, Karnataka State Nursing Council, in his address, congratulated MCON for being a pioneer in the field of nursing profession. He also appreciated the resources provided to the students in the form of excellent faculty and infrastructure. Tenzin Thupten, SNA presented the report of Student Nurses Association 2016-17. 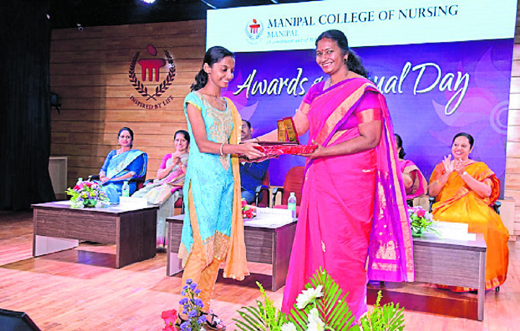 Dr Poornima Baliga, pro-vice chancellor, Health Sciences, MAHE, Manipal, in her presidential address, lauded the good work being done by MCON Manipal both in curricular and co-curricular activities. Dr Anice George, Dean, MCON, Manipal, presented the annual report of the college highlighting the various events, activities and achievements in the past year and also made a mention of the road ahead. Meritorious students of BSc Nursing, PBBSc Nursing, MSc Nursing and MPhil Nursing were awarded. Sharal Niveditha D’Sa was the Best Outgoing BSc Nursing Student of the year 2016-17. Niyola Jenifar D’Silva received the award for Best Clinical Expertise in BSc Nursing outgoing batch of 2017. Ranjini P and Shalini G Nayak, Assistant Professors, received the Good Teacher award. Dr Baby S Nayak, Professor, Department of Child Health Nursing received the ‘Most Accomplished’ faculty award.